These People Love to Collect Radioactive Glass. Are They Nuts? For many glass collectors, the only color that matters is Vaseline. That’s the catch-all word describing pressed, pattern, and blown glass in shades ranging from canary yellow to avocado green. 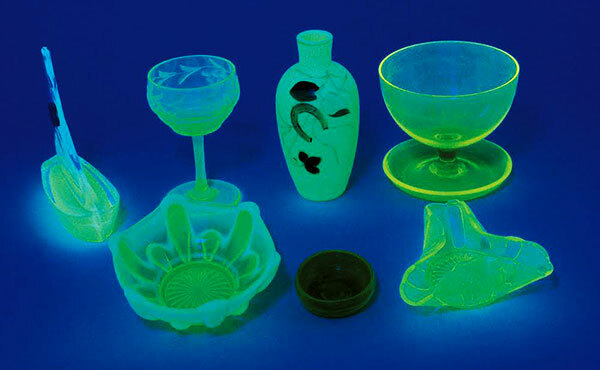 Vaseline glass gets its oddly urinous color from radioactive uranium, which causes it to glow under a black light. Everyone who collects Vaseline glass knows it’s got uranium in it, which means everyone who comes in contact with Vaseline glass understands they’re being irradiated. It doesn’t matter whether you’re the gaffer making footed cake plates in a glass factory, the driver loading boxes of lace-edged compotes onto a truck, or the tchotchkes dealer setting out vintage Vaseline glass toothpick holders and tumblers for prospective customers—all of you are being zapped. Let’s say you’re that tchotchkes dealer’s customer, and you decide to purchase those tumblers because you think their hue will go nicely with your lemony Formica kitchen table. Well, you just bought yourself four tumblers full of radioactive beta-waves. Go ahead and fill those tumblers with orange juice or milk, then serve these wholesome beverages to your adorable children. Now you’ve exposed your innocent lambs to even more radiation, since minute traces of the uranium in the glass can leach into whatever your kids are drinking, coating their throats and stomach linings with a cool, radioactive wash. After slaking your children’s thirst, carefully rinse those tumblers by hand to absorb sponge after sponge of even greater concentrations of radioactivity. For the record, none of this matters, not even a little bit. 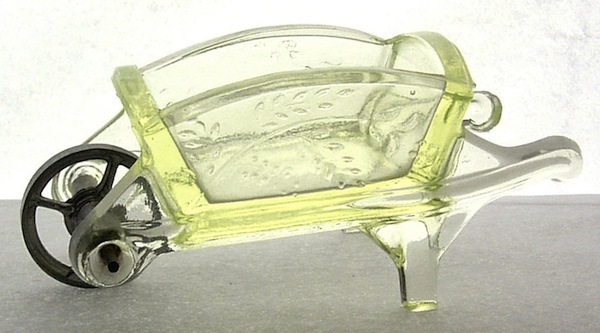 Yes, canary glass, uranium glass, or Vaseline glass, as it became known in the early 20th century for its similar color to petroleum jelly, emits radiation, but the amounts are tiny, infinitesimal, ridiculously small. Our bodies are subjected to many times more radiation every day. We receive a daily dose of radioactive contamination from the gamma rays that make it through our atmosphere after hurtling through outer space, from the naturally occurring radionuclides present in the ground we walk upon, from the background radiation lingering in the materials used to build the places we call our homes. Above: Flower vases made at the Thomas Webb & Sons factory in England. The vases rest on a Vaseline glass base. Photo via Dave Peterson at VaselineGlass.org Top: The relationship between a piece of glass’s propensity to glow and its uranium content is often not predictable. The piece at left contains no uranium at all, while the dark piece at bottom-center contains the most of the group. Photo via Vaseline Glassware by Barrie Skelcher. The beds we sleep in are radioactive; the lawns we sprawl out on during the dog days of summer are, too. In fact, there’s more radioactive potassium-40 inside each and every one of us than anyone could ever receive from handling, using, or just plain eyeballing a piece, display case, or entire museum full of Vaseline glass. If you are really worried about the trace amounts of radiation in Vaseline glass, you’d do better to stop putting bananas on your yogurt, to cut out all those healthy spinach salads, and to stay very far away from baked potatoes, all of which are packed with blood-pressure-lowering, radioactive potassium. None of this matters, either, but you’ve probably figured that out by now. Still, in our post-Hiroshima, Nagasaki, Chernobyl, and Fukushima world, radioactivity gives Vaseline glass a certain badass cachet. Some are drawn to its perceived menace so they can pat themselves on the back for not being intimidated by its unfairly toxic reputation. Others, like Dave Peterson, who co-founded Vaseline Glass Collectors, Inc., in 1998 and has written three books on the topic, gravitated to the material for more down-to-earth reasons. “It’s glass that does tricks,” he says, as full of affection for the stuff today as he was several decades ago, when he saw his first photo of a toothpick holder performing Vaseline glass’s most famous trick, glowing under a black light. Even if radioactivity is the thing that makes Vaseline glass cool, it’s not what makes Vaseline glass glow, says Barrie Skelcher, who’s written two Vaseline glass books of his own. That may come as a surprise to many Vaseline glass collectors, who assume that radioactivity is the reason why Vaseline glass glows under ultraviolet light, confusing the cartoon depiction of radioactivity for the science. My kid sister agrees. Normally a sibling’s opinion on a question like this might not be especially relevant, but Naomi Marks is a Ph.D. in geology and a research scientist at the Lawrence Livermore National Laboratory in California, where she, uh, well, I don’t actually know what she does, and she probably couldn’t tell me if I asked. Let’s just say she knows enough about uranium to confirm Skelcher’s statement. Not all Vaseline glass is transparent, as seen in this opaque, decorative bowl, whose uranium content is hinted at under normal light (left) but reveals itself fully under UV (right). Photo via Vaseline Glassware by Barrie Skelcher. “Clearly, it’s not radioactivity that makes the glass glow,” Marks says. “If it was that radioactive, you definitely wouldn’t want it in your home! The uranium fluoresces under UV light because the UV excites the electrons above the ground state and gives off photons as the electrons transition back to the ground state.” Sure, everybody knows that. “The fluorescence is just an inherent property of the uranyl compound in the glass.” Natch. So there you have it—the glow of Vaseline glass under a black light has nothing to do with radiation, as many people erroneously believe. Which is not to say that absolutely all glass that glows green under a black light has uranium in it. Other elements such as manganese can produce a similar effect, and sometimes pieces with a relatively large amount of uranium in them will glow less brightly than those with less, depending on the composition of a particular batch of glass. In general, though, if it glows green it’s Vaseline. Skelcher learned to look for that telltale glow when he was amassing his collection during the research he conducted for his books. “I sometimes shopped at outdoor antiques fairs in open fields,” he recalls. “As the sun began to set and the twilight came up, the real pieces of Vaseline would glow during that little window of time—that’s when I would look around the field to see which stands had uranium glass.” Although less ultraviolet light reaches the surface of the Earth at twilight, its effect is more pronounced since there’s also less visible light at that hour. 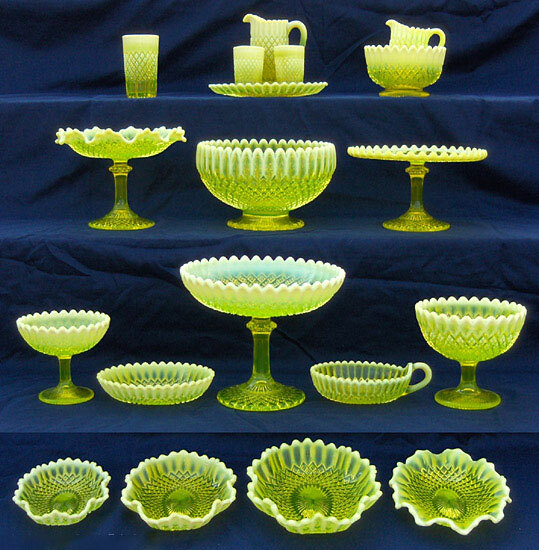 Thus, the stuff with uranium in it, as opposed to run-of-the-mill, uranium-free, green Depression glass, became a beacon to this sharp-eyed, Vaseline-glass hunter. 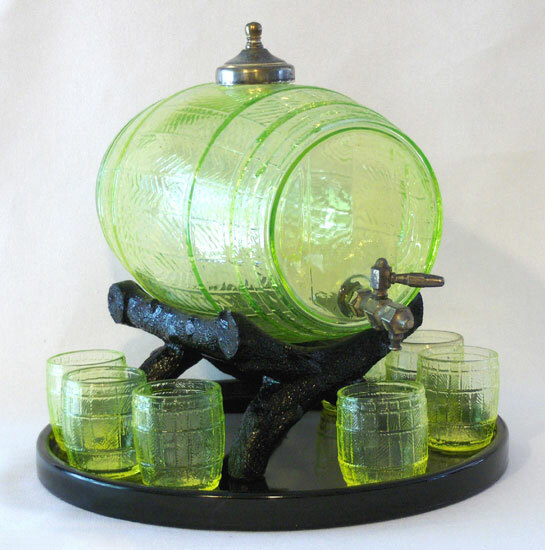 The name of the person who first used uranium in glass has long been lost to history, but the uranium-glass creation myth generally invokes Bohemian glassmaker Josef Riedel, whose factory in what is now the Czech Republic cranked out the first production-level quantities of uranium glass in the 1830s in two colors—Annagrun (green) and Annagelb (yellow). 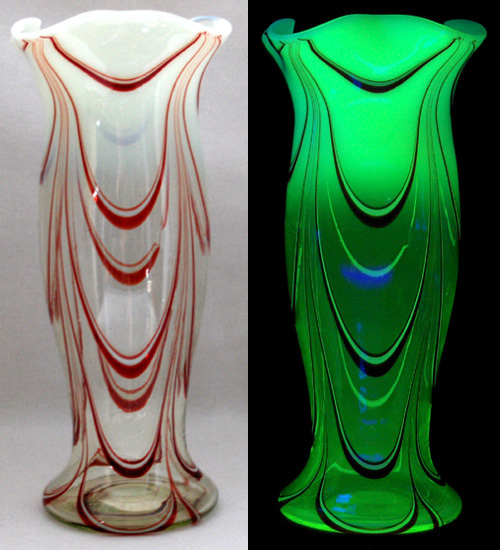 James Powell’s Whitefriars glass company in London almost certainly beat Riedel to market by a year or so, and Skelcher says he’s even found evidence of uranium glass manufactured in England in the 1820s using radioactive rock mined in Cornwall. Regardless of who did what first, we know that the mineral itself was identified in 1789, when German chemist Martin Heinrich Klaproth named it after our solar system’s most recently discovered planet. Back then, uranium was seen as just one more mineral to color clear silicon dioxide, the main constituent in the sand glass is made from. Chemists like Klaproth knew that cadmium turned glass yellow, cobalt made it blue, manganese produced violet shades, and certain compounds of gold went red when heated, blown, and cooled. Over the years, successive glass manufacturers in Europe and the United States melted a lot of sand to find out. In the Czech Republic, Harrach Glassworks used uranium in decanters, goblets, and trays, while Riedel put Annagelb and Annagrun to work in intricately cut and layered vases and handled mugs. 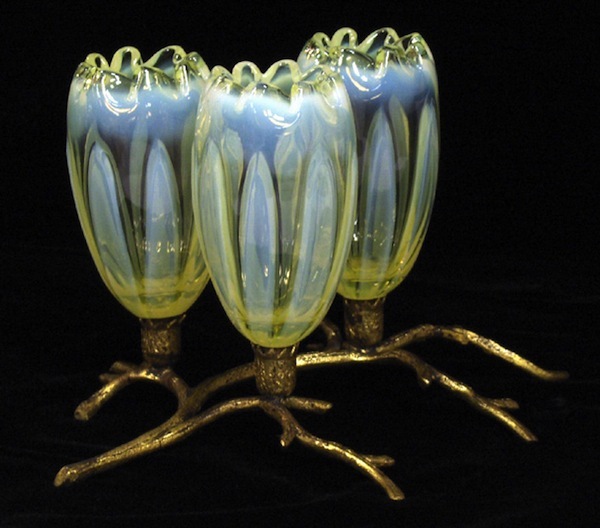 In England, one of Skelcher’s favorite glassmakers, Thomas Webb & Sons, began adding uranium to its glass batches in the 1840s; almost half a century later, a Webb recipe for an 1880s Topaz color called for a whopping 7.3 percent uranium by weight. In the United States, Pennsylvania companies from McKee to Adams to Westmoreland made Vaseline glass fairy lamps, candy containers, and lidded pots. Hobbs, Brockunier & Co. and Northwood of West Virginia were known in the late 1800s for their bumpy hobnail pieces, while one of the state’s (and country’s) biggest Vaseline glass producers, Fenton, arrived in 1907. Another West Virginia giant, Fostoria, didn’t get into Vaseline until the 1920s, which it marketed briefly as Canary. And then there was Ohio, home to the highly influential Cambridge Glass Company, whose uranium content in its Vaseline-glass recipes ranged from Thomas Webb & Sons-levels of 7 percent to as little as 1/10 of 1 percent. In general, recipes for Cambridge Vaseline hovered at the low end of that continuum, although a batch of an opaque color called Primrose called for 2.9 percent uranium by weight, which meant a batch of Primrose with 1,000-pounds of sand in it included almost 60 pounds of uranium. More typical was the recipe for a clear hue also called Topaz, like Webb’s, which contained 7/10 of 1 percent uranium by weight, or roughly 12 1/2 pounds per batch. 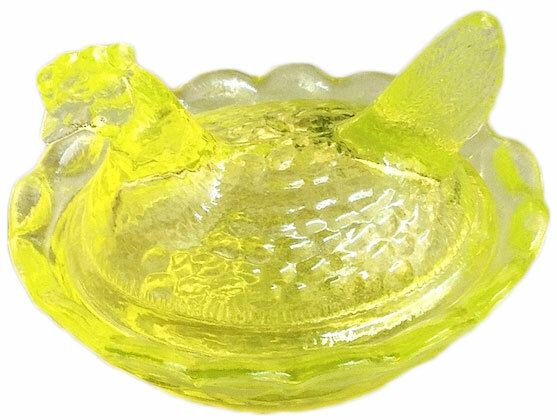 This Vaseline glass chick salt from Boyd’s Crystal Art Glass measures just 2 1/2 inches across. Those Cambridge recipes are from the 1920s and ’30s, long after uranium was discovered to be radioactive by French physicist Henri Becquerel in 1896 (he shared a Nobel Prize for his insight with Marie and Pierre Curie in 1903) but well before scientists understood how harmful radioactive materials could be to people’s health. Still, concerns for public safety, even misplaced ones, were not the reason why the popularity of Vaseline glass was already waning at the end of the 19th century and the first half of the 20th. According to Jay Glickman and Terry Fedosky, whose 1998 Yellow-Green Vaseline! remains one of the better primers on the subject, the decline of Vaseline glass had a lot to do with the picture Skelcher paints of those shadow-filled Victorian domiciles lit at twilight by shelves of glowing Vaseline glass. With the advent of electricity, such sublime moments were flooded by the glare of artificial, full-spectrum light. “Vaseline glass was a victim of the ordinary light bulb!” the authors exclaim. X-rays are far more powerful and dangerous than the comparatively paltry alpha and beta rays found in Vaseline glass. “Every house has alpha waves in it because every house has a smoke detector,” notes Peterson, referring to fractional micrograms of americium-241 that can be found in each device. Alpha rays are weak, which is why smoke needs to come in contact with the detector to set off the alarm, and they can be blocked by a flimsy sheet of paper. Beta waves are stronger, although a single pane of glass is all it takes to deflect them, and they dissipate within 18 inches anyway. In contrast, about the only thing x-rays can’t penetrate is lead, which is why they took such good pictures of bones, even those wrapped tight in flesh and boot leather. 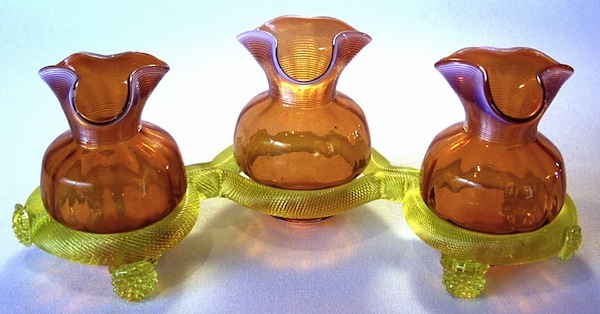 After restrictions on the civilian uses of uranium were eased in the 1950s, Vaseline glass made a comeback. In the United States, Fenton was one of the biggest producers until it ceased operations in 2011. 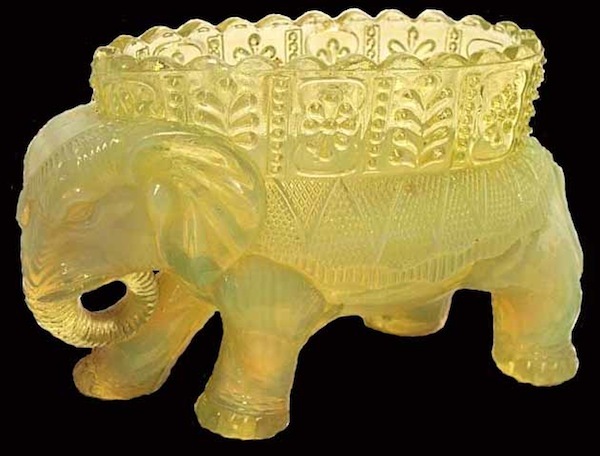 Mosser Glass, also based in Cambridge, Ohio, was founded in 1964 and is still pressing Vaseline glass, making molded-glass cake stands, mixing bowls, creamers, salt-and-pepper shakers, compotes, tumblers, candlesticks, oil lamps, punch bowls, water pitchers, kittens, hens, and chicks. For Mosser, Vaseline is just another color in its extensive catalog, like Amber or Aqua, Passion Pink or Hunter Green. This contemporary amber or topaz paperweight from England fluoresces green when exposed to UV light (right). Photo via Vaseline Glassware by Barrie Skelcher. Lead, of course, is another traditional ingredient in glass, as in leaded crystal. Again, referring to a Cambridge recipe, one batch from the first half of the 20th century called for 850 pounds of sand, 330 pounds of soda, 100 pounds of feldspar, 42 pounds of lime, 50 pounds of nitrate, 36 pounds of lead, 10 pounds of arsenic, 43 ounces of uranium, and 13 ounces of copper oxide. Lead was removed from household paint in 1978 because it is so harmful to children, which makes that 36 pounds of the stuff seem a good deal more menacing than a mere 2 1/2 pounds of uranium. Fortunately it takes several hours for the lead in a crystal glass to leach into, say, the wine that glass is holding, which means lead is fine for glassware but probably not a great idea for decanters if you don’t plan on drinking whatever is inside in a short period of time. With lead, though, there’s at least a use case in which the poison can enter your bloodstream. Getting uranium into your system, says Skelcher, would actually require a fair amount of effort. When asked to be more specific, about the scenario Skelcher could think of to make the small amount of uranium in Vaseline glass harmful to one’s health would be to grind up a piece until it was a fine powder and swallow it, which, he was quick to point out “would be a daft thing to do.” But in that daft scenario, the radioactivity in the uranium would now be in your body, and those alpha and beta rays would have nowhere else to go. Most people will probably be able to resist their urge to put Skelcher’s hyperbolic suggestion to the test, but that’s not to say fans of Vaseline glass are completely out of the woods just yet. It comes back to that trick, that fluorescing, that black-light glow people like Dave Peterson, Barrie Skelcher, and John Boyd enjoy so much. Black lights, by definition, emit nothing but ultraviolet rays, which are known to cause skin cancer (that’s why we put on sunscreen when we go outside, although now that’s supposed to be bad for us, too). Depending on its wavelength (the shorter ones are the worst), UV light can also damage the retina and cornea of the eye, which means the only truly dangerous thing about Vaseline glass is making it perform its trick. For his part, Dave Peterson plays it safe by making sure the black lights he uses emit the relatively safer, long UVA waves rather than the more harmful shorter waves that characterize UVBs or UVCs. “I’m more concerned about what black light I use than how much uranium I have in my house,” he says. Please don’t start using Upworthy-style titles for your articles. You’re better than this. Great read … humorous yet informative. Nice read – great photos – thanks! Great article. So much fun to turn children on to this kind of glass with a UV flashlight. There isn’t anywhere near the radio active uranium in this glass to hurt a fly! It is beautiful and well worth the adventure of collecting. Just be careful when selecting and always carry a ‘black light’. I almost bought a piece that was “married” and not worth 50 cents. Enjoy the travel!! Love to hear from anyone who is also collecting…. Is this satire? I hope it’s satire, but it seems a bit insistent to be anything other than completely serious. It’s disappointing how little people understand about radiation, feeling threatened by innocuous things; I suppose next you’ll be campaigning against brazil nuts (potassium, radium) and lima beans (potassium, radon), right? Oh, the terrors! Feeding your children mutagenic plantstuffs! It’s a wonder we’re not all walking around with a few extra ears on our fingers, for all the terrible Radiation™ we’re exposed to every single moment of our lives. Fie on all those sadists and their unwholesome contaminants! While yes, the glass IS radioactive, it won’t “leech out” into food if for some strange reason someone decides to use it for such (in my opinion, decorative objects should remain decorative) and won’t terminally irradiate hapless passersby.. Especially modern creations, which are usually produced more responsibly than antiques. What’s more is that blacklights are similarly overblown here — I’d be more concerned about the UVs through inadequate sunglasses while on the road, than exposure to a small decorative blacklight. This article was such a pleasure to read. The presentation of the facts kick-started with the sardonic irony at the beginning really hooked me. Loved the title, too. Bravo! >It’s disappointing how little people understand about radiation, feeling threatened by innocuous things; I suppose next you’ll be campaigning against brazil nuts (potassium, radium) and lima beans (potassium, radon), right? Well the big difference is how radioactive an element/isotope is and what happens when you ingest it. Potassium doesn’t matter because the amount in your body is fixed metabolically. Uranium isn’t very radioactive and clears very quickly when ingested (right out the kidneys). And not much will leach out of glass. So safe enough. As opposed to radioactive iodine which gets taken up by the thyroid. Or radium and radioactive strontium which collects in the bones. Or plutonium dust if inhaled, very bad news. Side note, somewhere a friend has some neon made from uranium glass. It’s kinda weird looking. Who do I believe ? I’ve heard about Vaseline glass and decided to do a quick Google. I have to say this is the most impressive article on the subject I’ve seen so far! An incredibly well written piece. Thank you for taking the time to go so in-depth with your subject! I heard about this glass on that storage unit show. Very interesting. I still wouldn’t want to consume anything out of it but it would be fun to have it on a shelf. One thing the article didn’t mention is the VALUE of this glass. What is it’s collectible value? Very informative; thanks for the interesting read, recently picked up a black light , now able to look at my Vaseline glass in a new light so to speak! i am 12 years old, but really? or 238U, wich are still more dangerous than americinium or plutonium. 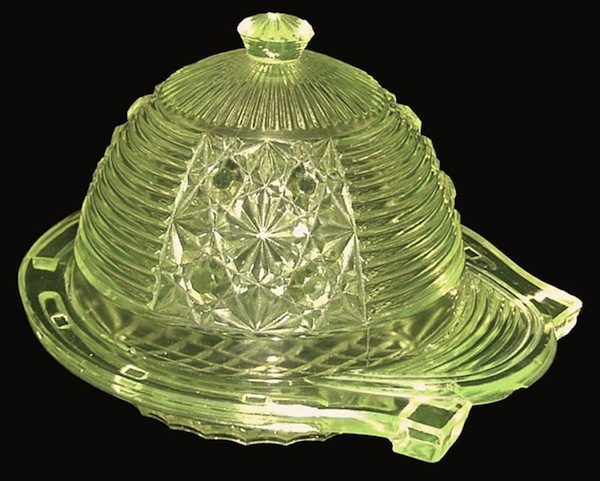 You don’t want to store food in uranium glass for the same reason that you don’t want to keep your wine in a leaded-glass decanter. It’s not because of the low levels of radioactivity. It’s because uranium, like lead (and many other heavy metals) is toxic and over time you’ll poison yourself. Informative and fun article – thanks for doing the research and adding the giggle! You mean U3O8, Triuranium octoxide. There is no such thing as Uranium-308, it would have far too many neutrons. Have a really nice very heavy, crystal, flawless, uranium (yellow, but even, deep & beautiful. I have found many similar in red, clear, blue, Moser, Pohls, Beidermeier, Baccarrat, Waterford, several other makers, no cigar. Supposedly it is 1858 to 1910 era. We have about 250 pieces of all across the board, makers, 1880s through today (custom pieces by out friends @ the Melting Point in Sedona, AZ) and have showed to many appraisors, glass collectors and no one has ever seen anything this magnificent, well made, beautiful, heavy for a lidded goblet, or chalice. Deckalpokal? Maybe someone here can help us please?? I have an antique plate made (~100 yo) of uranium glass. Recently I checked irradiation with the Geiger counter. it appeared to be approximately 300 cpm. What kind of emission is this? I was told that this alpha emission which is harmless. However, information on the website indicates that this is beta and gamma at low doses. If low doses why I have 300 cpm? I will greatly appreciate you opinion. Is there such a thing as blue uranium glass? thanks! I just showed a friend my green vaseline glass and a pink bowl totally glowed as well, I’m floored! Have you ever seen pink vaseline glass? Thanks! Just picked up a Geiger counter to check background and other things. with a plate for it to rest on. I was checking a closet full of vases and dishes for radiation. to say the least. Now I stay away from it. Actually all radioactive materials increase your risk for cancer. The greater the exposure the greater the risk. to let gas out.The Orange Fiesta wear is another matter. emitter.I keep items like this in a locked old fridge outside. I inherited an old vintage art deco floor lamp. It is 5 1/2 feet tall and consists of jade green and yellow alternating molded geometric pieces of vaseline glass on a bronze looking cast iron sculptured geometric base. It is topped with a matching jade green finial. I do hope the size and amount of glass in this is safe in tightly insulated house. Also, does anyone know the value of such a piece? Thanks, John! Just recently, I started collecting vaseline glass. I love it!! All week I’ve been reading up on it and yours was the best..Thank You!! Why are you bothering to bring up radioactivity in vaseline glass if it is well known to be so low in radioactivity as to be non-existent in terms of ever having any negative health effects? “ ” Part of the appeal was what a seaweed collection said about the collector.